I used to live in Holly Hills and then Boulevard Heights near Bevo. One of the joys of moving to St. Louis was discovering Bosnian culture via the large number of immigrants in South City at that time…mainly by way of the delicious Eastern European food. For a brief period, I would take massive walks by myself around dusk to find the perfect route through the Bevo/Holly Hills area to look at cool houses and street scenes…where do the sidewalks end? They don’t until you hit the industrial pockets and the burbs. These long walks cemented my obsession with St. Louis neighborhoods, people and architecture. It was inspiration to keep walking, keep exploring and eventually share what I thought was beautiful with others. Growing up in a suburb with no sidewalks, you walked in the streets. This endless walk on sidewalks fascinated me. Heck, I even signed up for an “Understanding Bosnian Culture” class at Long Middle School. It was here I took my first shot of Slivovitz. I was blown away by the honesty of that teacher. The things he relayed back to the class about things Bosnian immigrants liked about America and the things they didn’t are etched into my brain. I won’t get into the list because it’s usually not fair to take a small sample size of opinion and extrapolate that across a large group of people who once called St. Louis home. I say “once called St. Louis home” because my non-scientific opinion is that Bosnian-Americans are migrating out of St. Louis for small suburban towns in South County and beyond. I moved out of that part of South City years ago, but when I go back the numbers and reminders have faded. The smells are not there. Many of the coffee shops and restaurants are gone. But there is still a presence. And, the intersection of Gravois and Morgan Ford has monuments to the once strong and growing presence of this wave of immigration that brought so much small business momentum to a pocket of the city that was ebbing. 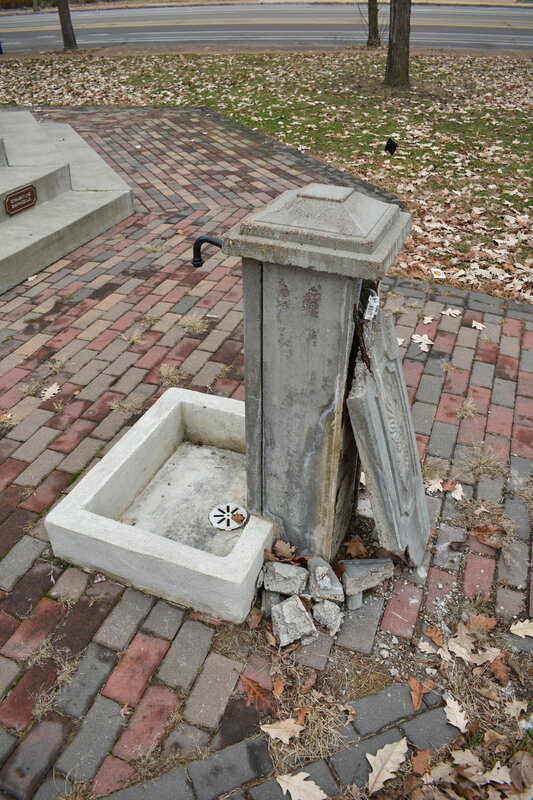 Back in 2013, the president of Bosnia and Herzegovina was right here in St. Louis to commemorate the groundbreaking of the Sebilj, a kiosk-shaped public fountain that harkens back to a the 18th Century Sarejevo Sebilj from the Ottoman Empire. St. Louis Bosnians who gathered in the Bevo Mill neighborhood Sunday to salute the groundbreaking of a monument to their motherland were themselves hailed by the president of Bosnia and Herzegovina. President Zeljko Komsic joined St. Louis Mayor Francis Slay and other dignitaries at a pocket park in the 5000 block of Gravois Avenue where the Bosnian community will construct a “sebilj,” a kiosk-shaped wooden and stone fountain. 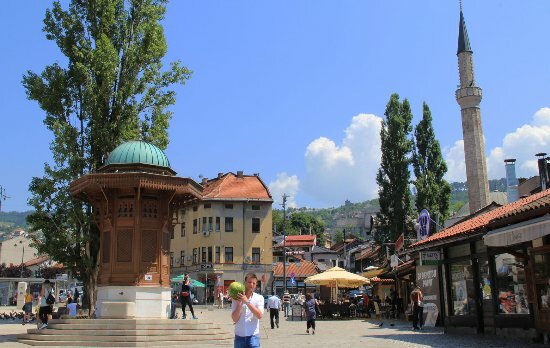 The structure will be a replica of the ornate sebilj built in 1753 in the Bosnian capital of Sarajevo. Komsic was in the country for the U.N. General Assembly last week in New York. He extended his stay to visit St. Louis and other Midwestern cities with large Bosnian populations. The money was raised by many in the Bosnian community, and was backed by the local politicians and supporters. Today the Sebilj has seen some damage, but is a beautiful reminder of the impact this group of Americans have made and continue to make in Bevo and elsewhere in South City. Living around here, the Bosnians assimilated quickly and with much success in small business. I had a lateral line replaced at my house, I had sidewalks replaced in front of a home in Holly Hills, I had a mechanic, a Toyota salesmen…all Bosnian. That’s just a few that come to mind, the impact of immigration is in my opinion, the most important thing for a city like St. Louis that is dying and bleeding residents. So my opinion that the population of 1st, 2nd and now 3rd generation Bosnian-St. Louisans is decreasing came from anecdotal observations of both South St. Louis and the suburbs south of the city. I have a son who played a year of club soccer…this is new to us. They practice 3 nights a week in the suburbs south and west of St. Louis. These parent errands to the suburbs struck me…so THAT’S where the Eastern European immigrants moved. Right off of Reavis Barricks…everywhere, walking the suburban streets, building mosques, opening restaurants. I tried to get some facts by contacting two separate Bosnian organizations and even someone on Twitter who I’ve never met but am pretty sure is of Bosnian descent. No one returned my requests for info. So, I’ll have to leave my observations as merely anecdotal. All I know is, immigrants make our cities fun and interesting. I am so happy I learned about their food and language and styles by being neighbors for several years and taking that Bonian Culture adult learning class at Long School. The most published photo I’ve ever taken on this website is that of a minaret in South City that likely would not have been built without the muslim influx to St. Louis in the late 1990’s. I’m sad they’re diluting out, but it is the American way. Get your sea legs, concentrate to meet your old country needs/cultures….move to the burbs. Heck, maybe I’m just being overly defeatist or dramatic and there are still 1st and 2nd generation Bosnians settling in the city…it just feels a bit less. And this is certainly subjective. I’m writing this to maybe hear of arguments or data to the contrary. Either way, I will always remember the concentration of immigration near Bevo, and always respect the vibe it brought and the lingering presence of people and places that to this day bring us joy. Thank you to all who stayed and allowed us a peak into your flavor, culture and love from a country I used to know nothing about.